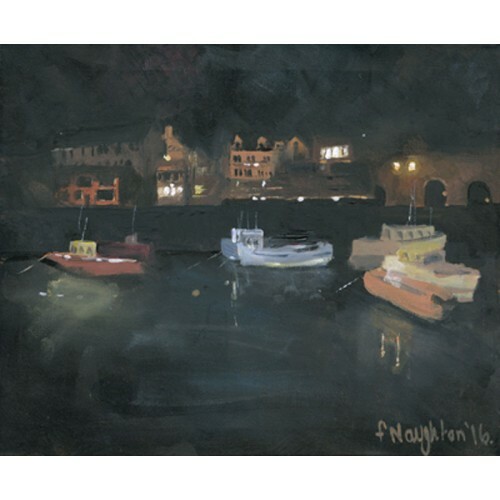 Seahouses harbour is transformed at night by the warm and welcoming lights of the town. This limited edition print was made from an original acrylic painting on canvas. A bright and uplifting depiction of Bamburgh beach. The limited edition print was made from an or.. It is well worth the climb above the dunes to catch this unusual view of one of Northumberland's .. The transient fluidity of the Northumberland sky above a tranquil Beadnell. The limited edition p.. Looking towards Craster village from the harbour. The limited edition print was made from an orig..
A view of charming, harbour side cottages. The limited edition print was made from an original ac..
A family walk between Seahouses and Bamburgh takes in the breathtakingly beautiful image of the F.. The magical and somewhat mystical Holy Island with its ever changing skies. This Limited Edition ..
Seahouses harbour is transformed at night by the warm and welcoming lights of the town. This limi.. Format: Limited edition Giclee print on Epson Archival Matte 190gsmOptional Single mounted on whit..